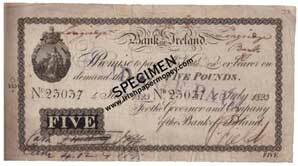 The Bank of Ireland was established by Royal Charter on 10 May 1783, by a group of over 200 Irish businessmen, land owners and clergymen, to stimulate and regulate the Irish economy and to provide it with a stable banknote currency. The bank was granted the sole right of banknote issue in Ireland except for Private banks of six partners or less, and was to be banker to the government. It commenced business on 25 June 1783, and proceeded to issue banknotes. The Bank of Ireland was essentially similar to a modern Central Bank of sorts, and was founded along the lines of The Bank of England and The Bank of Scotland. The Bank of Ireland’s first premises was in Mary’s Abbey, Dublin, purchased in 1784. In 1802 the bank purchased the old Irish Parliament House, College Green, Dublin, vacant since the Act of Union, 1801, and located its head office there in 1808. One of the most attractive buildings in the city of Dublin, the former parliament House has been the bank’s flagship branch ever since and was its head office for over a century. The creation of Joint Stock banks of note issue as a result of the 1824 Act, and the subsequent erosion of the Bank of Ireland’s special privileges, leading up to their abolition with the 1845 Act, provided for the effective reduction in status of the bank to that of a Joint Stock bank. It was as a result of this levelling of the rules that the bank felt it necessary to expand into the country and compete with the other banks by establishing its own branches, the first of which was opened in March 1825, in Cork. Prior to the 1824 Act, the Bank of Ireland had largely ignored the country outside of Dublin. The bank, however, still had significance, in that its assets and prestige far exceeded that of any other bank, and its notes were considered to be as good as gold. With Irish independence in 1921, the Bank of Ireland aspired to become the currency regulatory authority for the new Irish Free State, even though its ethos at the time would not have favoured Irish independence. Although it failed in these aspirations, the bank served as an important part of the Currency Commission’s currency distribution network. 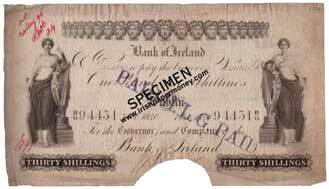 The Bank of Ireland issued notes under the Consolidated Banknote system from 1929 to 1939, as well as its own Bank of Ireland Northern Ireland issue. The Bank of Ireland exists to the present day,and continues to issue banknotes in Northern Ireland. The bank took over both the Hibernian Bank and the National Bank.